Sunnery James & Ryan Marciano are the dynamic DJ duo who have been nurtured by the Dirty Dutch family since the beginning, and for the third year running they present their own concept at the Heineken Music Hall – Amazone Project. In February 2010, Sunnery and Ryan launched their ‘Amazone Project’ event in the Heineken Music Hall Amsterdam. 5,500 fans came to join them and witnessed an exclusive five-hour-set. The ‘Amazone Project’ compilation landed on the #2 spot in the Dutch charts. ‘Varied, surprising and innovative’ is how the pair describe their own unique musical concept. 2011 saw the pair release many new productions for leading figures in the dance music industry including Steve Angello’s Size Records, Laidback Luke’s Mixmash Records, Spinnin Records, Defected, Cr2 and Erick Morillo’s Subliminal Records. All of these releases have helped to increase the appeal of the duo around the world, and they can regularly be found DJing across North & South America as well as the major European Festivals. 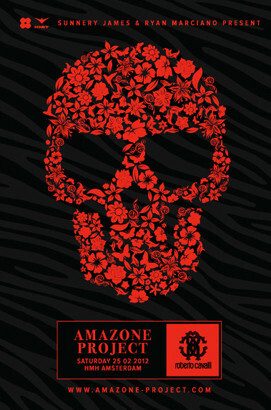 ‘Amazone Project Vol.III’ will be released one week before their "Amazone Project" showcase event which will be held in the Heineken Music Hall in Amsterdam on 25th February and features tracks from hugely popular artists such as Fedde Le Grand, Dirty South, Hardwell, Norman Doray and Gregor Salto. Check the teaser video below.